In the hurly-burly of what promises to be an interesting first year of the Trump administration, we are fascinated by this concept of who is a real American. Diversity is a social concept, made political only because it may well determine how people vote. But being an "American", it seems to us, is not a "concept" at all. It's something that's concrete, real and not capable of being misunderstood. You might not like some Americans, but that doesn't make them any less Americans. An American, we think, is someone who lives in America not because he has to, but because he wants to. Getting in to America may be hard for some, but leaving is easy. Just go. While being an American citizen surely makes you an American, citizenship is not a requirement for being an American. Just ask some of our grandparents. No, being an American is deeper than citizenship to us; as deep as the heart and soul of a man. It's deeper than freedom, because goodness knows, there are Americans who were slaves and Americans who were not allowed to vote or own property, either because of their gender or their religion. They were certainly no less Americans; sometimes, they were even more. dence from Britain, his homeland. On July 1, 1776, Salvador, now in the South Carolina Militia, rode to warn backcountry settlements of the impending attack of Cherokee elements who had allied with the British, giving him the nickname of the "Southern Paul Revere." Within a month, however, Salvador would be killed, ambushed by a group of Cherokees and their British handlers. He was 27 years old and, fighting in the backcountry, probably never learned that his own South Carolina delegation had indeed followed his advice in Philadelphia and voted for independence. You can't define an American by who he was, only by who he is. After all, we don't all think or even look alike. Besides, none of that really matters. Not to a real American, anyway. Look, once and for all, this Labor Law 240(1) thing is not that all-fired difficult. We sometimes scratch our heads to figure out why motion courts bend over backwards to find wrinkles in a cloth which has none. Of course, usually when one see blemishes in a piece of goods that has none, an ulterior motive is at hand, such as trying to buy something for less than its worth. church. A ladder, which was permanently affixed to the wall, shifted as he descended from the attic, causing him to fall 12-17 feet into the choir loft. Plaintiff had nothing in his hands as he came down the ladder. The ladder itself was "attached to the wall in a jerry-rigged fashion," wired to the to top of a joist bean with wires. The pastor of the church guessed that the ladder had been there since the church had been built, some 150 years before plaintiff's fall. Supreme Court denied plaintiff's motion for summary judgment under 240(1), based, it appears, on defendant's argument, that plaintiff was carrying tools in one hand and missed a rung with his free hand, had nothing to do with the ladder shifting and, even if true, did not prove that plaintiff was the sole proximate cause of his own injury. By the same token, the claim that plaintiff didn't use a safety harness or rope provided by defendant was unavailing. That the safety harness was available was meaningless, since there were no anchorage points specified and the rope used to hoist materials up into the attic was scarcely a "safety device" under 240(1). Ultimately, "plaintiff's decision to use the ladder already in place cannot be the sole proximate cause of his accident where he was never instructed not to use it." So, what do we have? 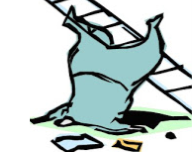 A plaintiff, doing covered work under 240(1), is injured by falling from a ladder which shifts while he is using it, causing him to fall to the ground. Other than the ladder, there are no other safety devices supplied by his employer. Hmm, sounds to us sus- piciously like a 240(1) case. The AppDiv agrees.